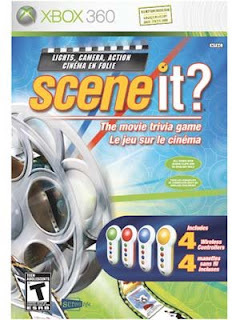 Thesource.ca is offering the movie trivia game Scene It? at the very reasonable price of $34.99, just in time to pick up before the coming holiday. If you need something to steer the dinner conversation away from more sensitive subjects *coughelectioncough* this Thanksgiving, I would strongly suggest this game. Let's face it, our society knows more about movies than politics anyway, why not put it to some use? You can find Scene It, bundled with 4 big button controllers and batteries at The Source in store, or online here.